ESPN’S SportsCenter Live From Heinz Field For Week 6 | "IT'S A STEELERS WORLD"! Pittsburgh Steelers fans are encouraged to join the special broadcast of ESPN’s SportsCenter on the Road series and will air from 8-10 am EST from outside Heinz Field. So whether you have tickets or not, be sure be there to show your support the Steelers who will be taking on the Arizona Cardinals at 1:00pm EST. The game will be airing on FOX. ESPN’s signature news and information program SportsCenter will originate from Pittsburgh on Sunday morning with a two-hour program hosted by Hannah Storm. Part of ESPN’s SportsCenter on the Road series, the program will air from 8-10 a.m. ET from outside Heinz Field, site of Sunday’s Arizona Cardinals-Pittsburgh Steelers game. 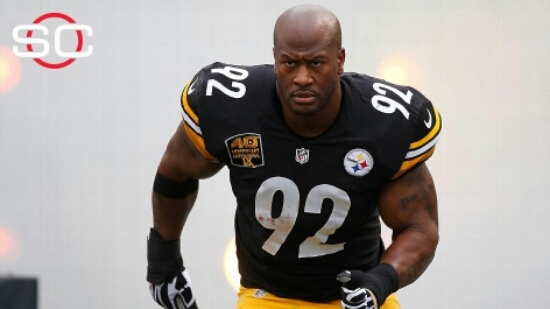 In addition to regular SportsCenter news and highlights, the program also will include Steelers LB James Harrison in a “Face to Face” interview with Storm, who also will interview Steelers WR Antonio Brown. Steelers legends Lynn Swann and Rocy Bleier and team president Art Rooney II will appear on the SportsCenter set during the show. SportsCenter anchor Car Champion will join Storm on the program with some of the scenes from around the stadium and anchor Lindsay Czarniak will be reporting from inside the stadium as the two teams prepare for the game. Also joining the telecast will be ESPN NFL analyst Bill Polian. SportsCenter on the Road has visited some of 2015’s biggest sporting events including the Super Bowl, NBA Finals, NFL Draft and the Mayweather-Pacquiao fight. Since the start of college football season, the program has originated from Notre Dame, Michigan, St. John’s University, Boston College, Clemson and North Dakota State. On the day before the Pittsburgh show, SportsCenter will originate from the University of South Carolina from 7-9 a.m. and after Pittsburgh will move to Chicago for 6 p.m. shows from the first two games of the National League Championship Series at Wrigley Field on Tuesday and Wednesday of next week. So get your “Black & Gold” gear laid out and those “Terrible Towels” waving to check out the action “Pittsburgh Steelers Style”! Where can I see the replay of this program at Heinz Field on 10/18/15?